Al-Aqsa TV (Hamas), song Expel the Thieving Occupier from the Enraged Land of Jerusalem broadcast approximately half an hour before the Al-Aqsa TV building was bombed by Israel on Nov. 12, 2018, in response to hundreds of missiles shot into Israel from the Gaza Strip. This video was rebroadcast on March 25, 2019. The soldiers of Muhammad have started to return." Female prisoner, Wafa Al-Bis (i.e., terrorist, attempted to commit suicide attack): "My principle was to try and kill as many Jews as possible." Additional female prisoner: "I can’t live beside Israel. There are people who can live in peace beside Israel. I can’t live in peace because it occupied my land." Wrap the explosive belt around [your waist]..."
"In response to the American statements regarding the American recognition of the Israeli ‘sovereignty’ over the occupied Syrian Golan Heights (i.e., in northern Israel), Official Spokesman for [PA] President [Mahmoud Abbas and Fatah Commissioner of Information, Culture, and Ideology] Nabil Abu Rudeina said that the legitimacy of Jerusalem and the Golan will be determined by the Palestinian people and the Syrian people… Abu Rudeina continued, saying: 'This Israeli escalation is receiving blind American bias [in favor of it] that will lead to more escalation and tension in the region, and there will be no peace, security, and stability in the region and the world unless the decisions of the international bodies and the Arab Peace Initiative are implemented, which call for Israel's withdrawal from all of the occupied Arab territories in return for peace with the Arab states and the Islamic states.’"
The image shows former PLO and PA Chairman Yasser Arafat wearing a keffiyeh (Arab headdress) and gesturing to a picture of the Temple Mount. To the mothers of the Martyrs (Shahids), to the mothers of the prisoners, to the mothers of the detainees, to the Palestinian mothers, who were nursed by Palestine with the milk of honor and glory, to the Palestinian women – may you be the masters of the land every year"
(In Arabic:) General Union of Palestinian Women"
Fatah official expresses PA's support for Syria, which face the same "enemy", the US and Israel; states "We must reexamine our positions... in order to deal with this enemy, who understands only the language of violence"
[PA] Minister of Religious Affairs Sheikh Yusuf Ida’is condemned the occupation government minister of agriculture and group of settlers’ invasion of the Al-Aqsa Mosque plazas. He demanded to put an end to this arrogance, which will lead the region to a bad and bitter end. Ida’is again called on the Arabs and Muslims to act to save Jerusalem and the holy sites. He said: ‘We have warned and are still warning about the real dangers surrounding the Al-Aqsa Mosque. 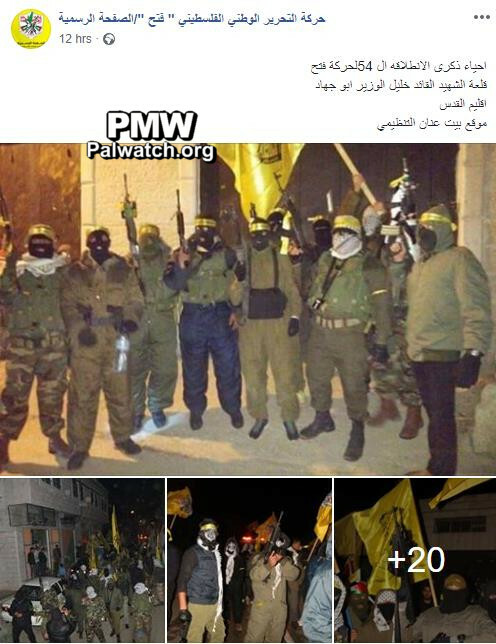 This obligates the Arab and Islamic peoples and the Arab and Islamic governments to place the issue of Jerusalem and the Al-Aqsa Mosque at the top of their priorities.’"
Fatah posts image of masked fighters holding rifles, calling them "rebels"
The image shows masked and uniformed Fatah terrorists wearing yellow Fatah headbands and keffiyehs (Arab headdresses) and holding Kalashnikov assault rifles. 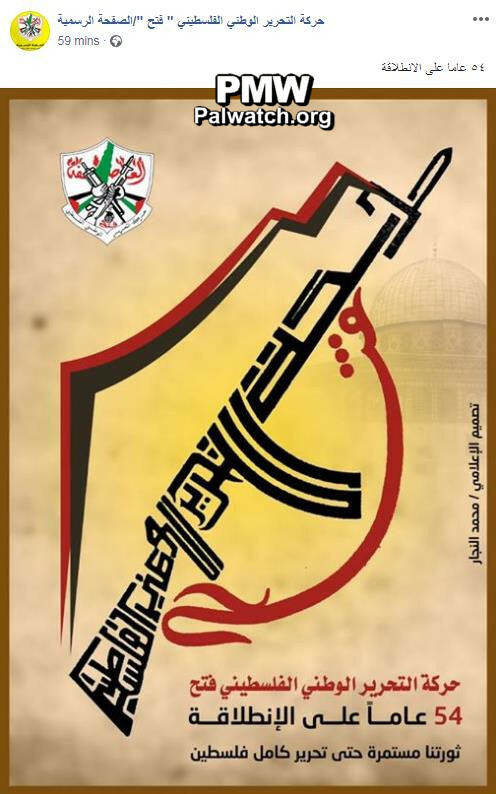 In the upper left corner is the Fatah logo that includes a grenade, crossed rifles, and the PA map of “Palestine” that presents all of Israel as “Palestine” together with the PA areas. He continued: 'Starting from Eilabun (i.e., attempted bombing of Israel's National Water Carrier), the Jordan Valley, Al-Karameh (see note below –Ed. ), Tel Al-Zaatar (i.e., massacre committed by Lebanese Christian militias in Lebanon in 1976), Lebanon, the intifadas (i.e., Palestinian wave of violence and terror against Israel, approximately 200 Israelis murdered, 1987-1993, and PA terror campaign 2000-2005), and the rest of the battles of honor and heroism with which the Fatah Movement has brought glory to the nation – and we talk about our past and are proud of it, but we also depend on it to build the future... We will complete the path, without any shadow of a doubt, and we still see that our most important priority is to fight our primary enemy – the occupation – and those who assist it.'" Posted text: “Commemorating the 54th anniversary of the Launch (Intilaqa) of the Fatah Movement (i.e., commemorating the anniversary of their first attempted attack; see note below). The image shows a group of masked men in military uniform holding assault rifles and wearing yellow Fatah headbands. 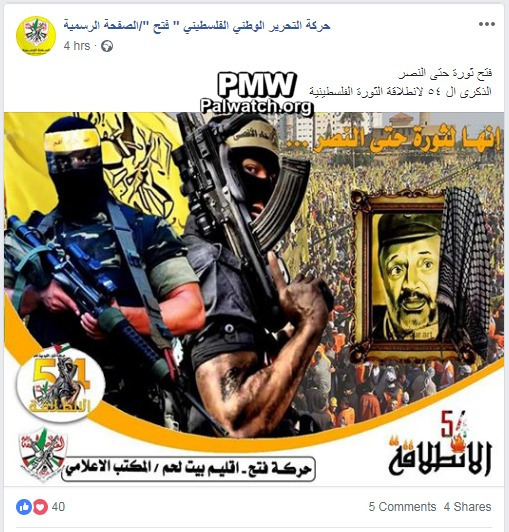 One of them is waving a yellow Fatah flag bearing the Fatah logo that includes a grenade, crossed rifles, and the PA map of “Palestine” that presents all of Israel as “Palestine” together with the PA areas. 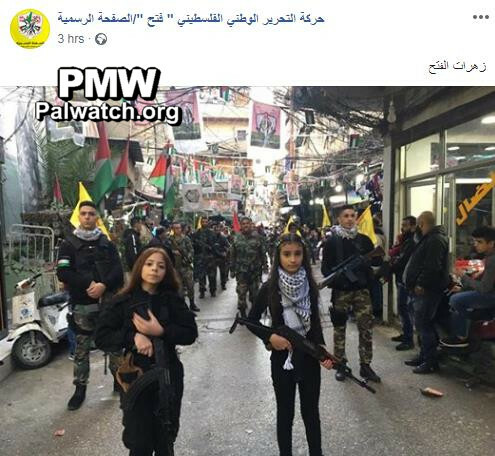 The picture shows two girls armed with assault rifles leading a procession of uniformed men armed with assault rifles, some carrying Palestinian and Fatah flags. 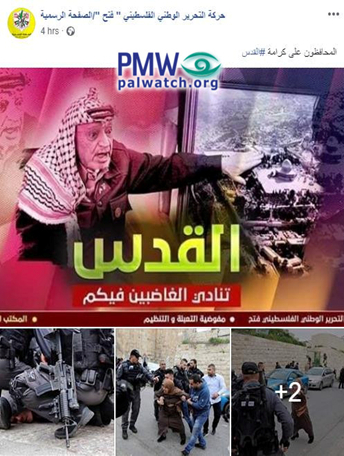 The video shows part of a Fatah procession for the 54th anniversary of “the Launch” (Intilaqa) of Fatah, commemorating its first attempted terror attack against Israel. Men, most of them masked and wearing keffiyehs (Arab headdresses) and yellow Fatah headbands, are carrying unlit torches, Palestinian flags, and yellow Fatah flags with the Fatah logo that includes a grenade, crossed rifles, and the PA map of “Palestine” that presents all of Israel as “Palestine” together with the PA areas. One of the participants calls out a chant to which the other participants respond by shouting “Shabiba,” apparently indicating they are members of the Fatah Shabiba Y outh Movement. 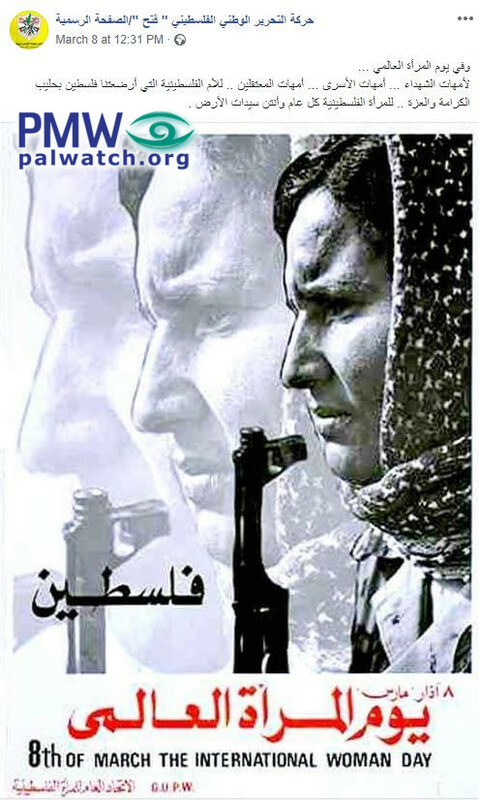 Intilaqa - "the Launch" refers to the beginning of Fatah on Jan. 1, 1965, when it carried out its first terror attack against Israel, attempting to blow up Israel's National Water Carrier. 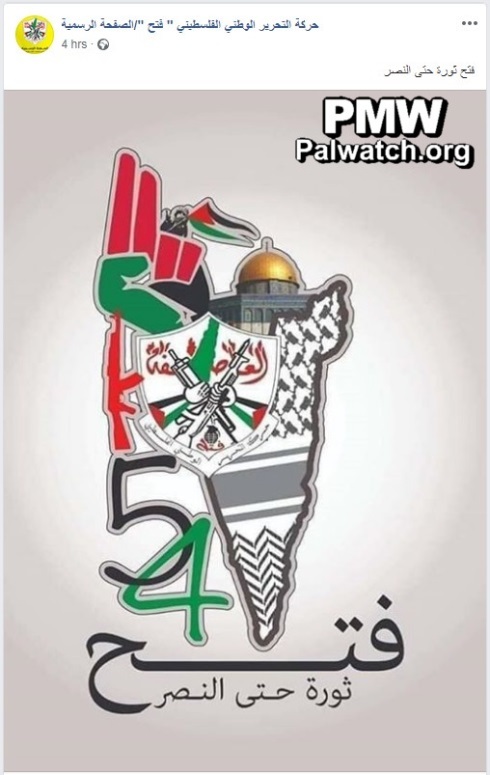 The image shows a logo for the 54th anniversary of Fatah's "Launch" (Intilaqa), commemorated on the anniversary of Fatah's first attempted terror attack. 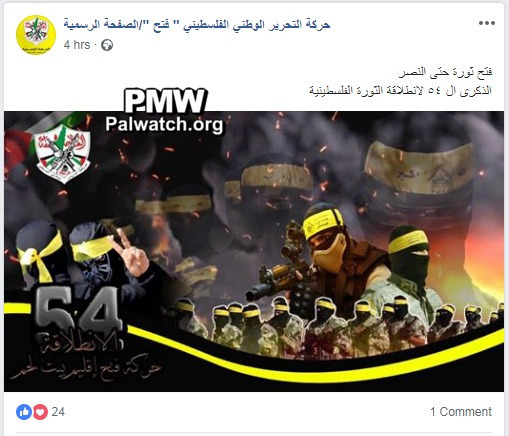 Posted text and text at bottom of image: "Fatah – revolution until victory"
The image shows armed masked members of the terrorist organization the Al-Aqsa Martyrs’ Brigades (Fatah’s military wing) wearing yellow Fatah headbands. The image shows armed masked members of the terrorist organization of the Al-Aqsa Martyrs’ Brigades (Fatah’s military wing). 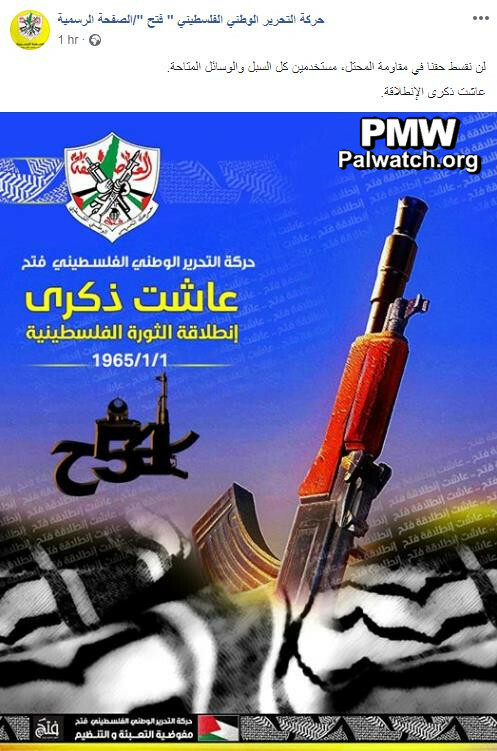 Image on Fatah Facebook page features rifle with text: "We will not relinquish our right to resist the occupier using all available ways and means"
Posted text: "We will not relinquish our right to resist the occupier using all available ways and means (i.e., term used by Palestinians, which also refers to the use of violence and terror)‎. In the background are the repeating words: "Long live the Launch of Fatah"
"[PA] Minister of Justice Ali Abu Diyak said that the occupation government intends to prepare a new package of aggressive racist legislation that provides legitimacy to the violation of the principles and regulations of international law, committing crimes of terror against our people, and threatening international peace and security. Abu Diyak added in a statement yesterday [Dec. 20, 2018] that foremost in this legislation is the law to expel the families of the Palestinians who carry out operations… Abu Diyak emphasized that these racist and aggressive laws and the crimes of the occupation and settlement, regardless of their force, will only increase the strength, toughness, stability, and determination [of the Palestinian people] to stand firm and defend our legal national rights, the national project, and the legitimate Palestinian leadership, led by [PA] President of the State of Palestine [Mahmoud Abbas]. They will also not dissuade our people from continuing to struggle through the legal means and on all levels until the achievement of freedom and independence, and the establishment of an independent Palestinian state whose capital is Jerusalem." “The Palestinian Democratic Union FIDA called on the members of our people wherever they are throughout historical Palestine (i.e., Palestinian term that includes all of Israel and the PA areas), and particularly in the West Bank, Jerusalem, and the Gaza Strip, to escalate all of the means of popular resistance and to go out to the field, particularly at the points of conflict with the occupation forces and the areas of friction with the settlers, and particularly next to the settlements and the racist annexation and expansion wall. It also called on them to stand against the occupation soldiers and its settler herds to block them and force them to stop the series of attacks that have been strengthening over the recent hours against the citizens, their vehicles, and their property.